The use of O-rings extends to many fields. The main function that characterizes this type of joint is its ability to maintain the seal, preventing the mixture of liquids and gases. They are characterized by their versatility and resistance to high pressures and temperatures. The type of elastomer used in its manufacture can vary. 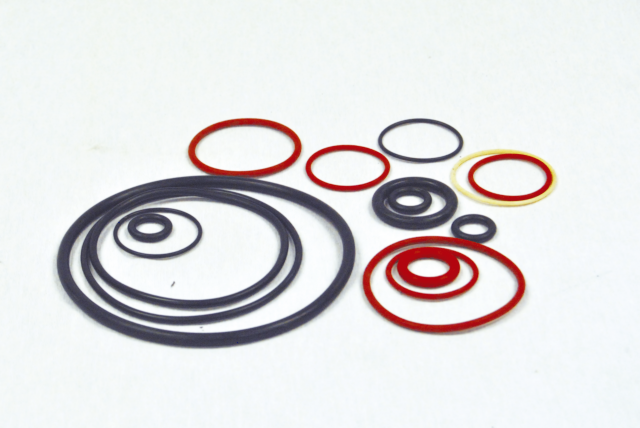 Buna-N / Nitrile (NBR): The standard material for O-rings. For general purposes. Mineral oils and greases, derivative of the plants and animals, air instalations, aliphatic hydrocarbons, dilute acids.Working temperature: -30ºC until +100ºC. Water to 80ºC. Ethylene Propylene (EPDM): Hot water and steam, hydraulic fluids, brake fluids, alcohols and ketones, coolants, cleaning products, Ozone. Work temperature -50 ° C to + 140 ° C.
Fluorocarbon / VITON (FKM): High chemical resistance. oils, gasoline, concentrated acids, solvents, ozone, oxygen. Working temperature: -20ºC hasta +200ºC. The terms FPM, FKM and Viton® very often cause confusion and lead to misinterpretations. All these designations actually stand for a single base material: flour rubber. FPM is the international abbreviation according to DIN / ISO, whereas FKM is the short form of the fluoroelastomer category according to the American standard ASTM. Viton® is the registered trademark of DuPont Performance Elastomers. Hydrogenated nitrile (HNBR): aliphatic hydrocarbons, coolants, ozone. Work temperature: -50 ° C to + 150 ° C.
Flurosilicone (FMQ, FVMQ)-SILICONE: Fats and oils of animal and vegetable origin, aromatic hydrocarbons, oxygen, ozone, hot air, and water vapor, aging. Work temperature: -50 ° C to + 200 ° C.
Perfluorinated elastomer / Kalrez (FFKM): It is the elastomer that offers greater chemical compatibility. It is perfect for aliphatic chlorinated and aromatic hydrocarbons, organic acids, and polar solvents. Work temperature: -20 to + 320 ° C.
Chloroprene / Neoprene (CR): The chlorine atom confers increased resistance to oils, approximately Nitrile Natural Rubber and this is often sufficient for many applications. Work temperature: -35 to + 100C. Poliuretane (PU): Polyurethane O-rings are especially suitable for carrying out applications where loads involved dinámicas.Entre such applications include, for example, water services, tires and a wide variety of critical applications. In many cases polyurethane o-rings are used instead of NBR, due to its high mechanical strength. Working temperature: -30 to + 100C. The range of hardness varies between 40SH and 90SH, and it is possible to manufacture them in colors according RAL/PANTONE. CPI Sealing Certifies its NBR, EPDM and FKM compounds for use under FDA regulations for the manufacture of FDA O-Rings and FDA molded parts. These compounds conform to the specification US FDA 21 CFR 177.2600. O-rings with certifications: WRAS, NSF, KTW, UL, CLP (ACS), W270, DWGW (EN549/EN534/EN681), on demand. diameter and the diameter of its section. We can manufacture according to standard or customer specification. Also joints made from O’rings cord, performing the vulcanized or glued joints, thus being able to obtain O-rings joints of all sizes.